When we talk about wedding preparations for a bride, the first thing that come in our mind is obviously a dress design and color of dress for brides. There is another thing that is equally important as bridal dress which is not other than bridal shoes. Brides always remain very conscious for their footwear and the things which they want to see in their shoes are as following. 1. The color of bridal shoes must be matched with the color of bridal dress. This is the first thing which a bride wants to see in her footwear. 2. 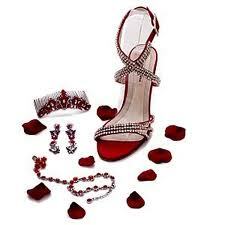 The next thing is the material of bridal shoes which is also very important. Obviously, leather is the most comfortable material but the variety of designs become limited in leather shoes. Hence the styles and designs in bridal shoes in the materials other than leather are countless. 3. The next consideration of a bride in terms of choice in bridal shoes is the design of shoes. In this regard, the choice of different girls is different. Some brides-to-be like long heeled shoes and some want to wear flat shoes. These are just the few things regarding bridal shoes.